Our NEMreview software has been assisting a diverse group of energy sector analysts to “slice and dice” historical data relating to the the east-coast National Electricity Market since as far back as 2001. Where we have seen them, we have included some examples of this here on our website, and will be compiling more here on the new NEMreview portal. (b) Expanding the range of data available – from the AEMO for the NEM, but also a broad range of time-series data relevant to the Australian energy sector. This has been a bottom-up rewrite of the software, and is taking some time – however it is enabling us to deliver a broader set of value to NEMreview subscribers. (b) By using the new version now, they are also best placed to input into our development process, to ensure that the new version we’re developing will closely meet their evolving needs into the future. We have very much appreciated the input we’ve been receiving from clients, and look forward to it continuing into the future. Who is NEMreview being built for? We’re expanding the scope of the data sets covered in v7 to cover the whole of Australia, and various commodities related to “energy” – hence taking the “NEM” in the product to mean a truly Australia-wide National Energy Market. What data sets are being included? Today there are 18,813 data sets currently available in version 7. 6) Reconciling the different registrations systems for power stations (i.e. AEMO for the NEM, IMO for the WEM, and Clean Energy Regulator for Large-Scale Renewable, plus more to come) has required us to compile a master list of power stations with meta data, Australia-wide, in a Generator Catalog that will be provided as part of a client’s NEMreview subscription, expanding on what’s in v6 (and extending out to prospective plant). 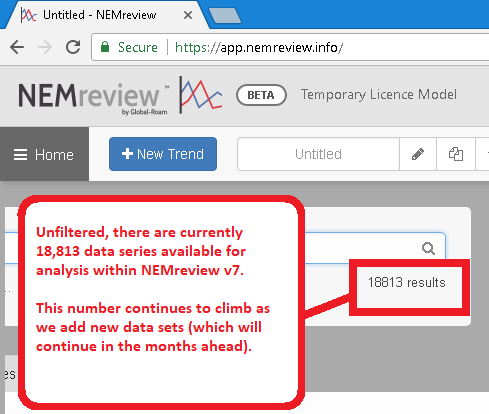 That’s a fair few data sets already – however we recognise that there’s a long, long list of other data sets we could be adding in.Rather than provide you a detailed list (and possibly skew the input you might provide us) we’d like to hear from you about what you would like to see in NEMreview v7. 1a) Currently there is no gas market data included in the early beta of v7. This is flagged for inclusion for both the STTM and the Victorian markets [TFS-9706] but we would particularly like to hear from you if you have specific requirements in terms of which data (we’re already collecting a fair bit for other purposes, just want to be sure that what we add in is useful). 1b) Also, if you can help us find good data for gas on the west [TFS-9345], please let us know? 2) We’ll also be adding in “simplified” bid data from generators in the NEM [TFS-9342] (we have several other, much richer, visualisations already in ez2view and are not seeking to reinvent that wheel). Beyond those two other additions, there is a long, long list of other data sets we could include – but we really want to be led by you, in terms of what’s important to you? Who is a target customer for NEMreview v7? NEM-Review v6 is used by a broad cross section of people who want to analyse the energy market for a range of commercial or other (e.g. policy, advocacy) reasons. We made a conscious choice to focus that version on analysts who did not work at the large market participants (we have other products, like ez2view, that provide for this), but rather to focus on making NEMreview more useable, and understandable, to analysts sitting on the outside of the market, looking in (and perhaps being as interested in the specifics of AEMO MMS lingo as a result).This broader external focus will continue with NEMreview v7, but will expand to encompass electricity, gas and green for the whole of the country. Also today, I’ve posted here some broader context of the underlying ez2trendTM technology we’re building to power NEMreview v7 along with other products, and ways we serve our diverse range of clients.